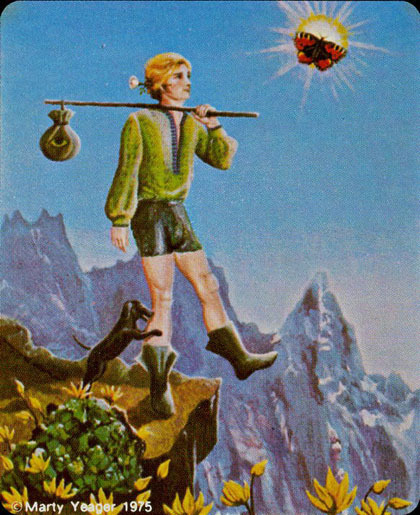 The Yeager Tarot of Meditation was originally published in 1975 by the artist Marty Yeager and Ken Hickenbottom as simply �The Tarot.� The male Court cards look like they are moonlighting at a strip joint when not busy posing for tarot portraits: The Pages wear only headbands, briefs and boots. The Knights wear only briefs, and the Kings are attired in just briefs and sandals. The thrones of the Kings and Queens and the headbands of the Pages bear strange words which on close inspection turn out to be anagrams. For the King of Cups the word is �FEEIL� (I feel), the Queen of Swords is �LYZEIANA� (I analyze), and the Page of Wands is �SIEE� (I see). The Minors are set against starry outer-space vistas, with different background colors for each suit: Swords are dark blue, Cups are light blue, Wands are maroon, and Pentacles are orangey-red. There are no pictorial scenes on the numbered pip cards. Since Yeager specifically intended his deck to be used for meditation, perhaps he felt that no one would be using the Minors much.